Sustainable Wealth empowers you to achieve your financial goals by unleashing the shackles of debt, no matter how uncertain the future may be. Filled with in-depth insights and practical advice, this reliable resource illustrates how you can predict economic booms and busts before they happen, adapt to changing markets and plan for lasting financial stability. Over the course of his career, Axel Merk has been at the forefront of identifying major trends, a leader in the public policy debate on how to fix the economy, and guide for investors looking to navigate the global credit crisis. 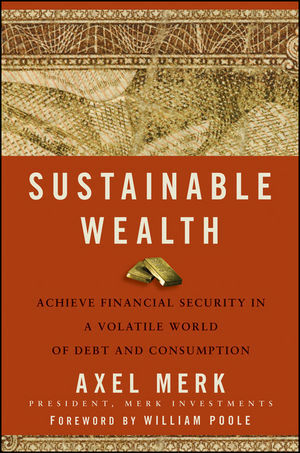 With this new book, Merk puts your financial decisions in a global context and shows how factors ranging from the Federal Reserve and Congress to trends in Asia and Europe influence your financial well-being. As investors struggle to adapt to the new financial landscape, Sustainable Wealth provides straightforward answers to the tough financial questions we face-and the tools to achieve a financially sustainable lifestyle. Axel Merk is the President and Chief Investment Officer of Merk Investments LLC, an SEC registered investment advisory firm that manages mutual funds specializing in currencies. He has published articles describing complex economic phenomena in understandable terms and is a frequent expert presenter and moderator at conferences. Merk is a sought-after voice in financial news, known for his understandable advice and uncanny ability to predict market movements. He is a regular guest on CNBC and Fox News, and is frequently quoted in Barron's, the Wall Street Journal, Bloomberg News, USA Today, and the Financial Times. Achieving Excellence as a Financial Pilot. A Volatile World of Debt, Consumption, and Temptation. The Flight You’re About to Embark On . . .
Part I A World of Temptations. Chapter 1 The Temptation of Credit. The Relationship Between Credit and Debt. The Power (and Un-Power) of Central Banks. Credit as a Threat to Sustainable Wealth. Credit as Fuel for Other Temptations. Chapter 2 The Temptation of Consumption. The Cost of a Consumption Economy. What This All Means for You. Chapter 3 The Temptation of Policy Change. The Boom/Bust Cycle: Can You Fool Mother Nature? Above and Beyond: The Fed Ventures Into Fiscal Policy. More Bad Medicine for Boom/Bust Cycles. Regulation and Taxes: Consistency is the Best Policy. Policy, Complacency, and Sustainable Wealth. Chapter 4 The Temptation of Complacency. The Complacency of Business Legacy. Trust Must Be Earned Every Day. Part II Achieving Sustainable Wealth. Chapter 5 Challenging Conventional Wisdom. Should You Use an Adviser? The Proactivity of Sustainable Wealth. Adaptive Investing, Rather Than Staying the Course. Chapter 6 Saving and Spending in a Volatile World. Sustainable Wealth: A Store of Value. The Individual Wealth Cycle Model. The Importance of Pay As You Go. Getting a Handle on Expenses. How to Spend Less Than You Earn. Make the Important Standard-of-Living Decisions. Sustainable Wealth in a Volatile World. There’s No Such Thing as a Safe Asset. Finding a Place to Hide: Depression Investing. How to Invest in a Bust. Chapter 8 Profiting in a Volatile World. Stock Investing: Investing for Value. Diversification with Real Estate and Land. Profit Opportunities in an Uncertain World. How to Invest in a Boom. Toward a Sustainable Wealth Investing Model. A Golden College Savings Plan. Taking Risks Without Jeopardizing Sustainable Wealth. Sustainable Investing and the Sustainable Wealth Lifestyle. Chapter 10 The Pursuit of Sustainable Wealth and Happiness. The Rewards of Living Within Your Means. Leaving a Legacy: Sustainable Giving. Surgeon General’s Warning: Sustainable Wealth May Be Addictive.